Do you ever feel things just aren’t right? Maybe you go through your day thinking you are forgetting something? Perhaps nothing is going the way you expected it to? I think we all have those moments. This life throws so many crazy things at us like a monkey at the zoo! (you know what they throw) We wake up with aches and pains we didn’t have a few days ago. Our loved ones pass away. We have devastating news or circumstances. We just feel blah today. How do we do it? I just got on my knees and prayed for two separate families who have lost such a vital part of their family structure this week. I know they feel like the air has been sucked right out of their lungs. They are in such pain, it truly is heartbreaking for everyone who knows them even just a little bit. On my knees, I thanked God for the awesome things that will come out of these tragedies. I heard those words come out of my mouth and then found myself surprised at it. What did I just say? Then into my brain came….Awesome things can come out of pain when eyes turn to Jesus. There was the answer. JESUS is the answer! Then I also asked God to show them Him in all of this, because they can’t do it RIGHT without Him. Nothing can be done RIGHT without him. You can think it’s all good and be satisfied, but you are missing out on the endless possibilities that are available when you do not lean on your own understanding, but fully put your trust in HIM. Let me repeat this, NOTHING can be done RIGHT without HIM. God just showed me things in my prayer that I needed to remember. I need to keep remembering and I pray that these two families can as well especially right now. That is what I’m praying for the most. GOD is Awesome. There is nothing impossible when He is in the mix. Do you feel like things just aren’t right? Wonder what you are doing wrong? Life just not turning out the way you expected it? I get anxious about things. 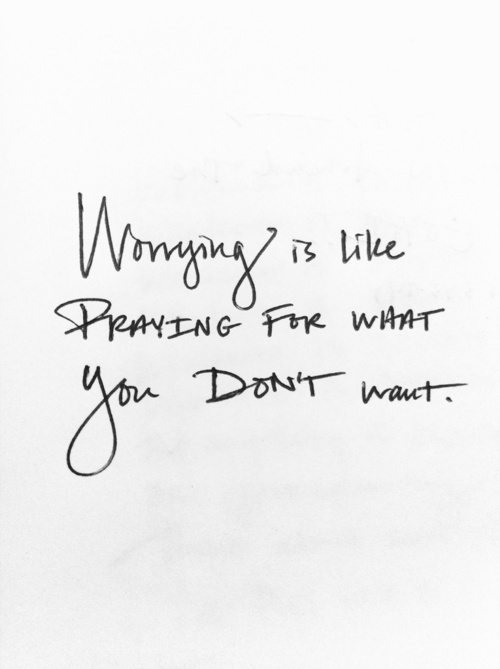 I don’t call it worry, but that is what it is sometimes. I’m not saying I’m a “worrier” (is that how you spell that? ), but I do concern myself with things that really aren’t necessary at times. This week I have a lot of things ahead of me that need to be done and I’m praying that everything goes smoothly. I know there are much crazier things going on in this world than the things in front of me, but I ALSO KNOW that Philippians 4:6 says IN EVERYTHING… meaning God cares about all of it! I can take anything to HIM…BIG or small. I take absolute comfort in that. I feel at peace knowing that He cares and wants me to ask Him for help. He is there for me and I can speak to Him. I thank Him and praise Him for it all! He knows my fears. He knows my concerns. He knows what I have to do. He knows how it will turn out. I thank Him in advance for all of the things He is doing and will do with all the stuff that needs to be done this week. I love that I can count it all already as blessings! I’m confident in HIM. He is my confidence. Thank You God for this verse, for allowing me to take my cares to you and for giving me the assurance that YOU WILL BE WITH ME through it all! Amen. HE gives you a song! I am burdened with names of people who need Jesus. Praying for them is not a burden. I mean, I ache for them. I want them to know Jesus. I pray so hard that God softens their hearts and shows them HE is the Lord…JESUS is the ticket, the key, the path to being happy in this life and eternally happy. I want Him for everyone! So, when this song came up that I had never heard before, I KNEW GOD gave me this song! He does it all the time… not only did He give me this song, he gave me the ability to sing it. I struggled some and prayed a bunch and when I finally sang it all the way through correctly, I CRIED. It is such an emotional thing when you know GOD DID IT. He did it through you, for you and is going to use it for others. That is the most amazing feeling. To know YOUR GOD loves you and cares for you and gives you a song. HE GIVES YOU A SONG! **sing it** …whatever it may be!